Total detachment, total cybernetic bliss, and total glitzy wonderment: our future brought to glorious technicolor vision in “Close 2 Me,” the latest single by L.A. pop duo Paper Chains. A deep bass-driven rhythm and the catchy staccato hook of vocalist Stereo Diamonds work in parallel to create a track that’s as grimy and sincere as it is vibrant and poppy – a cyberpunk love affair if there ever was one. Atwood Magazine is thrilled to premiere Paper Chains’ entirely self-produced music video for “Close 2 Me” off their debut EP, Stereo Diamonds. 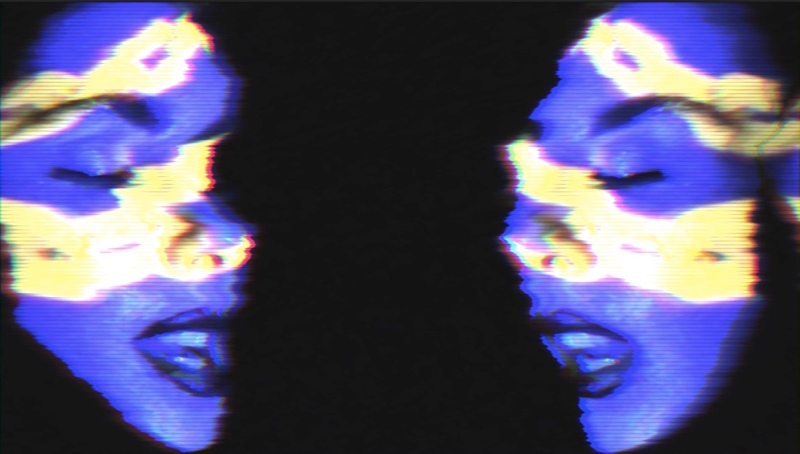 Eight-bit visuals spliced against the spectral image of singer Stereo Diamonds herself provide for an audiovisual romp that’s sure to leave a viewer awestruck. Everything here serves a purpose: bright colors, jittery cuts, and a retro-futuristic motif embrace their own visual staccato, the neon-saccharine lyrics floating along above them like they’re dancing a waltz together. The bouncing, plucky hits of producer and guitarist Jonny on the Rocks – characteristic of his style – bring to the track an industrial, trance-dosed flare that gives the otherwise minimalistic song some grounding. Vaguely avant-garde, defiant, yet grounded in musical reality. This is what makes Paper Chains special, and it’s this combination that draws them up as contemporaries with such prolific names as Grimes and Chvrches and lends them endless potential for growth and further experimentation. The video for “Close 2 Me” is “an experiment in detaching from the real world,” says vocalist Stereo Diamonds. “Something artificially created, bright, glossy and energetic.” Contributing something new to the musical conversation, playing around with visuals and innovating past the point of it being a gimmick. Paper Chains has achieved something truly unique here: bright, glossy and energetic. A great end to summer.